You are currently browsing the category archive for the ‘Chinese tour operators’ category. 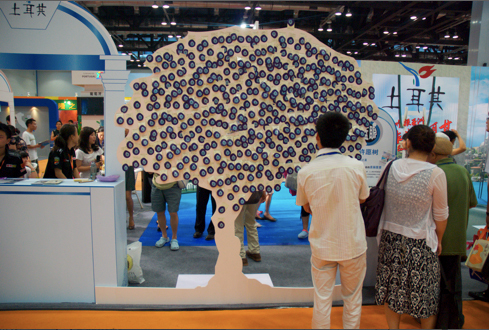 The Turkey booth on the Beijing International Tourism Exhibition (BITE) was one the booths which got the most interest due to a huge 3D Bosphorus Bridge image and Blue Eye wishing tree. 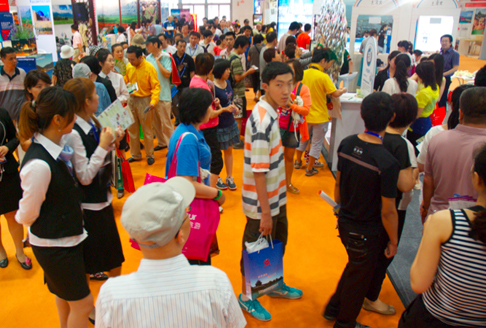 Turkey was enthusiastically welcomed by the crowds at the eighth Beijing International Tourism Exhibition, held on June 17-19. The Bosphorus Bridge in Instanbul is a major tourist attraction, linking East and West. 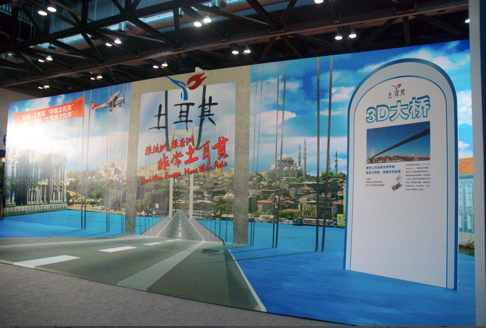 The Turkey booth featured an 11 meter long Bosphorus Bridge 3D image and drew hundreds of photo-snapping visitors into the booth. Turkey staff also took photos, which will be posted onto Turkey’s Official KaiXinWang account, for visitors to download. 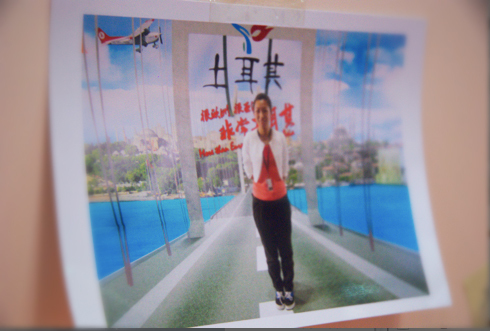 Turkey’s Kaixin Wang platform also hosts Turkey travel news. Another crowd-pleaser was the Turkish traditional nazars (blue eyes). 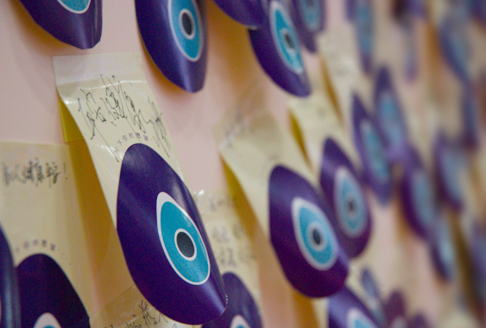 Visitors wrote their holiday wishes on blue eye stickers and posted them on a wishing tree. Every day after the event the tree was chock full of stickers and needed to be cleaned for the next day. The Turkey event was a popular attraction, drawing hundreds of people who took photos, made wishes and left their email addresses. The BITE booth was home to six travel agents, Turkey Culture and Tourism and Turkish airlines. Astronaut Travel was responsible for finding and planning the event. The booth was built and installed by Astronaut‘s partner agency Zhongjia. 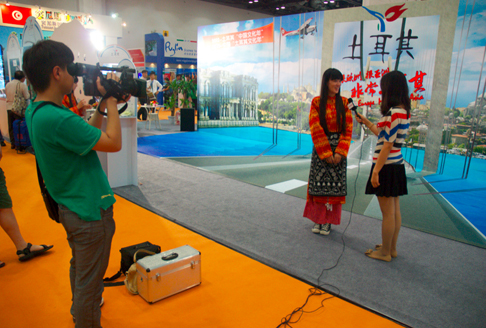 The Beijing International Tourism Exhibition is China’s biggest and most important travel show. For more info about the BITE, click here. Japan recieved two Chinese tour groups in Kyushu and Kansai regions Friday, the first group travel to Japan from Chinese mainland since the March 11 catastrophic earthquake and tsunami. These familiarization trips are part of Japan’s active efforts to restore its tourism industry. Hiroshi Mizohata Commissioner of Japan Tourism Agency (JTA) traveled to China and South Korea in early April, meeting government officials, media and travel agents. The two countries made up about 40 percent of all foreign tourists visiting Japan in 2009 and Chinese tourists are regarded as the biggest-spending among foreign visitors. The company has sent people to the Chinese mainland and Hong Kong to make sales calls and invite media and travel agencies to visit Okinawa and Hokkaido. 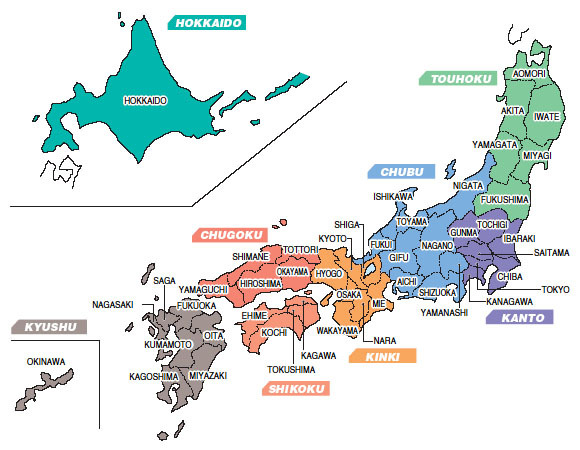 Meanwhile, Shinkansen bullet train services on the disaster-stricken Tohoku Shinkansen line fully resumed Friday, the first day of Japan’s Golden Week holiday season, between Tokyo and Shin-Aomori for the first time in 50-days since the mega earthquake and tsunami. On the popular Rakuten website’s travel page, a large number of popular Onsen hotels in the Tohoku region are shown to be fully booked during the Golden Week holiday. Read the full Xinhua news article here. 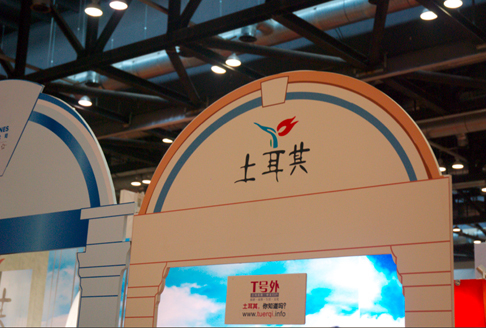 Entering its 7th year, the China Outbound Travel and Tourism Market (COTTM) exhibition took place 13-15 April 2011 in Beijing. Astronaut was among the outbound travel industry players at the event. For more information, visit http://www.cottm.com. Sites such as eLong let Chinese travelers book air tickets online. How will the online booking market be affected by Google’s recent purchase of the software company ITA? “We expect limited financial impact of Google-ITA on Expedia, given only about 12 percent of Expedia’s revenue is from air and with ITA, Google will also become a source of qualified leads for OTAs (similar to Kayak),” said Naved Khan, an analyst at the brokerage firm Jefferies & Co. The China National Tourism Administration (CNTA) is drafting new measures to further open the Chinese outbound travel market for international travel companies. 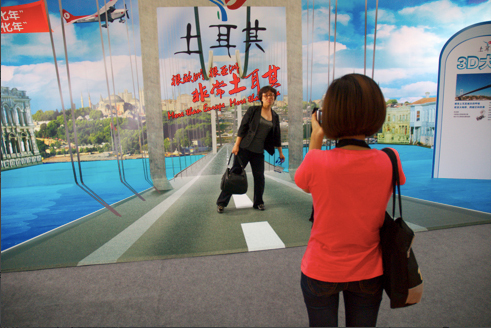 As for now foreign companies are not allowed to offer traveling abroad to Chinese tourists. International travel companies from 14 countries and regions, including Germany’s Tui and Japan’s JTB, have established 44 foreign joint ventures in China. The companies stayed in business in China even though they earned little or even suffered losses. 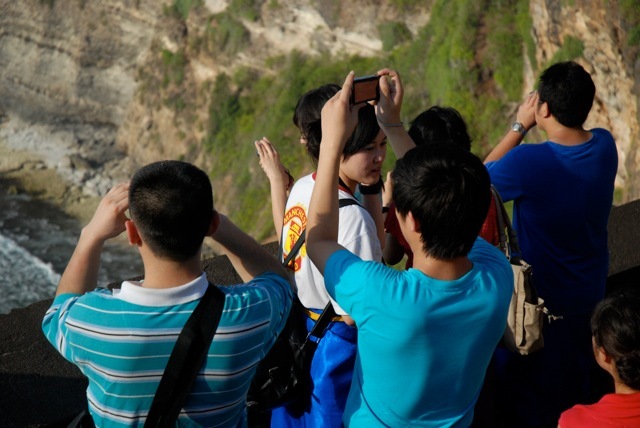 But now government has given clear signs that soon non Chinese tour agencies will be allowed to organize outbound group travels. This will change tourism landscape dramatically, but how fast the implementation will be nobody knows. 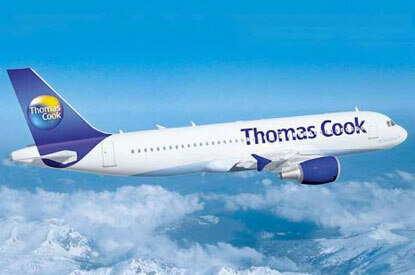 The quintessential British travel brand Thomas Cook is planning to enter the Chinese travel market this year. Operating already in 20 countries outside the the UK, the company is now eying to Russia and China. The focus is clearly on high street distribution, rather than the internet and call centers. Although for years analysts have been predicting the death of the high street agent at the hands of the internet, Thomas Cook’s figures show a different picture. In the UK just 34.7% of holidays are booked online, with the rest coming from retail and call centers. This is especially true for China where solemnly relying on the internet for marketing and sales is not enough.